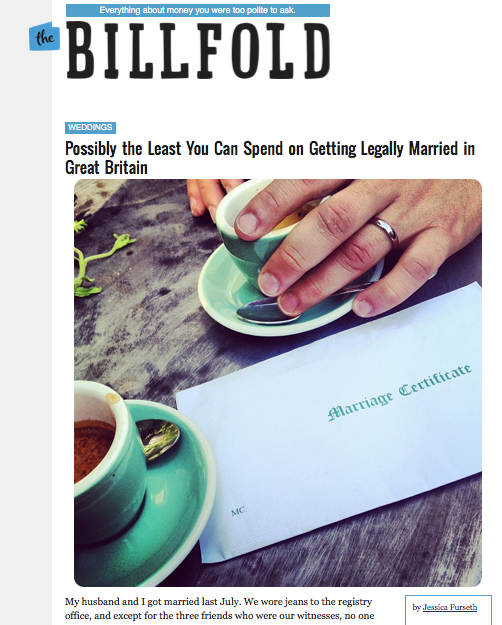 The Billfold, 2014. Original article. My husband and I got married last July. We wore jeans to the registry office, and except for the three friends who were our witnesses, no one knew anything about it until it was over. For us, it was perfect. As a side effect, it was also ridiculously cheap. We started the planning 10 days later, once we realised we couldn’t think of a single reason not to go through with it. In the end we were engaged for 32 days, mainly because the British system has a 16-day waiting period for marriage permits. Hiring a room for 15 minutes at the Town Hall, with a marriage official and registrar. (This is the Thursday rate; Saturdays cost more.) £79, or £5.80 per minute. Pub lunch afterwards: Free, paid for by our wedding guests. Replacement ring when my husband left his in a hotel bathroom six months later: £25 … Somewhere out there a crooked and/or underpaid hotel employee is trying to sell that ring, only to be told it’s not platinum but titanium, hence it’s essentially worthless. Except as a symbol, that is. Published in The Billfold, 2012. Original article here. 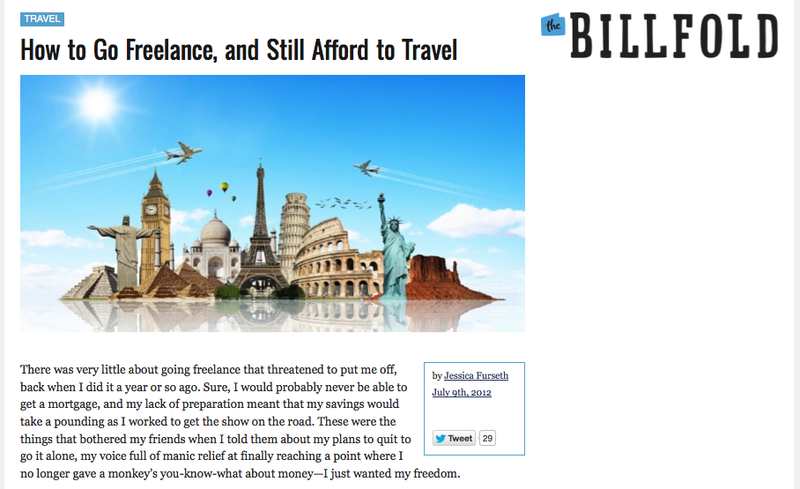 There was very little about going freelance that threatened to put me off, back when I did it a year or so ago. Sure, I would probably never be able to get a mortgage, and my lack of preparation meant that my savings would take a pounding as I worked to get the show on the road. These were the things that bothered my friends when I told them about my plans to quit to go it alone, my voice full of manic relief at finally reaching a point where I no longer gave a monkey’s about money; I just wanted my freedom. The only thing that niggled at me about my plan, or should I say lack thereof, was the fact that I probably wouldn’t be able to travel. I love going places, mostly long weekends in neighbouring European countries, but I suspected my hair-brained idea would cost me my precious San Francisco trip. I’d lived in the Bay Area for three months when I was a very impressionable 19, and I’d fallen hook, line and sinker for the foggy city and was gagging to go back. But transatlantic vacations are for people who sweat it out in offices, collecting regular salaries … right? 1. I’m a freelancer; I’m a minimalist. The day my pay checks stopped coming in at regular intervals was the day I stopped shopping. Goodbye to new clothes, trinkets and gadgets; hello make do and mend, libraries and hand-me-downs. This may sound restricting but I found it strangely liberating, knowing I could live on very little money. It made me feel in control. And unless you are Kate Middleton, no one needs more than five dresses, I swear. Of course, I still get coffee and the occasional Thai meal with friends, but now that my income is so closely tied to my efforts, the value of money has gone up. 2. Experiences are the new Things. As a kid I remember thinking it doesn’t count as a gift unless it’s wrapped. Don’t get me wrong: I get as excited as the next geek over my Apple products, but generally speaking, shifting my focus from things to experiences has gone a long way to make me happier spending less money. For me, freelancing meant trading money for time, but this is the thing: they were right when they said the best things in life are free. Happiness isn’t a widescreen TV, it’s an afternoon walk by the canal with an ice cream. Or at the very least, I’m convinced you can have just as good a time, if not better, at the hole-in-the-wall Vietnamese restaurant where you can bring your own beer, as you can at some fancy place with linen napkins. 3. Let your freak flag fly. Of course, this sudden tightwad attitude may well cause people to think you are weird. I remember the look on my then-boyfriend’s face when I suggested that instead of spending three figures on his birthday present, I get us some fish and chips and a bottle of rum, and throw the money saved in a pot marked ‘Rome’. Apparently that’s not as romantic as I thought. So beware: once you start comparing every price tag to or airmiles, there may be casualties. 4. We do what we want. When I announced having finally bought my San Francisco ticket, people would lament over not having the money to do something similar. Then they’d show me what they’d just bought from American Apparel. I’ve realised most people resent being reminded of the connection between the two, because underneath it all, we do what we want – even if we don’t realise it. I kept thinking I wanted to buy my own place, but it finally dawned on me that I’ve moved ten times in the past ten years so I’m probably the rootless kind. I’ve now stopped reading the real estate pages. To sum it up: if you want to travel, stop buying takeaway pizza. 5. Keep your eye on the prize. I can spend a hundred on a big night out, or I can use that money to pay for a whole week in a hostel in Istanbul. Of course there has to be a balance, but chances are you can have just as good a time on half that money if you’re careful. And while being a new-ish freelancer puts me at a disadvantage when it comes to cash, the time saved on commuting alone means I now have time to cook from scratch. But all this presumes one thing: that there is something you want, and badly. For me it was a Mission burrito and a view of the Golden Gate Bridge. Now I’m thinking it’s high time I go to a little place called New York. I hear it’s incredible.